The crude oil of about 45 ℃ is pumped from the tank to the equipment, enters into the crude-oil heat transfer system with the temperature increasing to 110~120 ℃ and flows into the electrical desalter. The desalted oil which is heated up to 220~240 ℃ after heat transfer enters into the flash column (with the top pressure of 0.15MPa) for flash separation. Then the oil gas from the tower top flows into the 27th tray of the atmospheric column while the oil at the tower bottom, which is heated up to 280~290 ℃ after being pumped and pressurized, flows into atmosphere furnace and is heated up to 360~370℃, then enter into atmospheric column for separation. First-line oil flows from the 30th or 32th tray into the upper stage (Column-103) of the atmospheric stripping tower, then it is pumped into heat exchanger and heated up to 45℃, and after flowing into the diesel alkali-washing or water-washing ionizer (Volumn-111) combined with second-line oil for electrochemical treating, the stripping oil gas returns to the 33rd tray of the atmospheric column. Second-line oil flows into the middle stage of the stripping tower from the 18th or 20th tray of the atmospheric column and then it is cooled down to 60～70℃ by the heat exchanger and condenser. After flowing into the diesel alkali-washing or water-washing ionizer (Volumn-111) combined with first-line oil for electrochemical treating, the stripping oil gas returns to the 21st tray of the atmospheric column. Third-line oil flows into the bottom stage of the stripping tower from the 8th or 10th tray of the atmospheric column and then enters into the mixed heavy oil equipment after being cooled down to 70℃ by the heat exchanger and condenser. Then the stripping oil gas returns to the 12th tray of the atmospheric column. Fourth-line oil is drawn directly from the 5th tray of the atmospheric tower and enters into the stripper tower combined with the third-line oil. 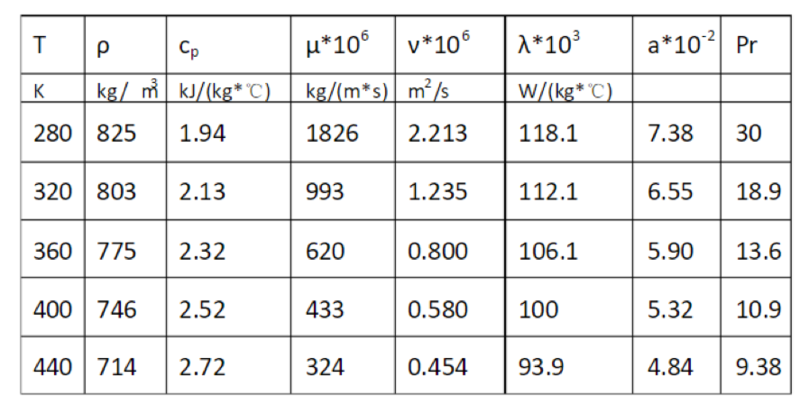 Atmospheric tower has one top and two middle circulating refluxes in order to adjust the load distribution of the gas-liquid phase and recover heat. Top reflux oil is cooled down to 70℃ after being pumped out from the 38th tray of the atmospheric tower and returns to the 40th tray. 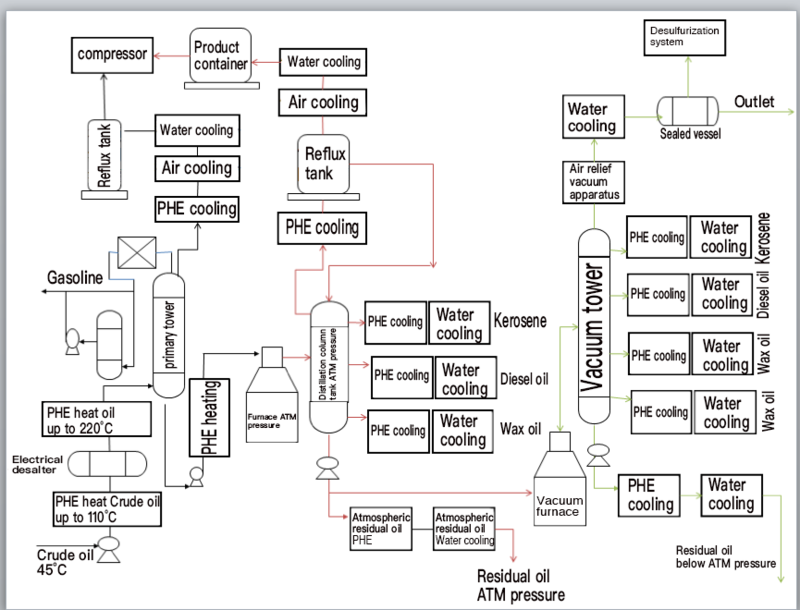 First-line middle reflux oil is cooled down to 146℃ after being pumped out from the 26th tray of the atmospheric tower and returns to the 28th tray. Second-line middle reflux oil is cooled down to 219℃ after being pumped out from the 14th tray of the atmospheric tower and returns to the 16th tray. The bottom reflux oil enters into the vacuum furnace (Furnace-102) after being exhausted by the pump and pressurized, and then it enters into the vacuum tower (Tower-104) through the low speed transfer line for separation after it is heated up to 380℃. Vacuum overhead oil gas is led from the vacuum overhead volatilizing line and passes through the first, second and third level vacuum water cooler and evacuator, then it is cooled down to 50℃. The condensed oil and water flows into the vacuum overhead separate tank (volume-105), and the vacuum overhead oil is pumped out of the equipment, with the vacuum degree remaining about 99.32KPa (745mmHg). The topping gas oil of 126 ℃ is cooled down to 40 ℃ after flowing through the topping hot-water heat exchanger and air cooler and enters into the topping reflux tank. The topping non-condensable gas is led to the topping gas tank and enters into vacuum furnace after liquid separation. The topping gasoline is extracted by the topping gasoline pump, some of which returns to the primary tower as top reflux and the other flows out of the equipment as product. The gas phase returns to the 14th layer after the side oil is stripped in the stripping tower. And the side oil is pumped out by the pump, cooled down by the primary cooler to 50℃ and sent to the tank after heat exchange. The primary bottom oil of 280℃ is pumped out by the underflow pump, heated up to 395℃ by the vacuum furnace and enters into the vacuum tower for distillation. The oil gas from the atmospheric overhead enters into the return tank (Volumn-103) for oil-water separation after being cooled to 70 ℃. Hot refluxed oil required by the atmospheric tower is pumped out from the reflux tank to the tower top. And the uncondensed oil gas enters into the overhead product tank for oil-water separation after being condensed to 40℃ by the condenser. Overhead oil pumped by the water into the oil gas alkali-washing or water-washing ionizer (volume -109) for electrochemical treating. The bottom reflux oil enters into the vacuum furnace (Furnace-102) after being exhausted by the pump and pressurized, and then it enters into the vacuum tower (Tower-104) through the low speed transfer line for separation after it is heated up to 380℃. Vacuum overhead oil gas is led from the vacuum overhead volatilizing line and passes through the first, second and third level vacuum water cooler and evacuator, then it is cooled down to 50℃. The condensed oil and water flows into the vacuum overhead separate tank (volume-105), and the vacuum overhead oil is pumped out of the equipment,with the vacuum degree remaining about 99.32KPa (745mmHg). Vacuum tower equipped with three padding sections, three layers of oil sump tank and three combined liquid distributors, with metal mellapale packing on the first two layers and metal intalox saddle in the under layer. First vacuum side stream is exhausted from the first layer of oil sump tank and cooled down to 80℃ after heat exchange, some of which flows out as product and some of which returns to the upper part of the first padding section as vacuum overhead reflux oil after being cooled down to 40℃ by the condenser. Second vacuum side stream is exhausted from the second layer of oil sump tank, one line of which is cooled down to 80℃ after heat exchange and flows out as product, one of which returns to the upper part of the second padding section as vacuum overhead reflux oil and the other of which returns to the upper part of the third padding section as light wash oil with no need to be cooled. Excess vaporization oil (third vacuum side stream) is exhausted from the third layer of oil sump tank, some of which returns to the upper part of the third padding section as heavy wash oil, some of which mixes with the second vacuum side stream, enters into the mixed heavy oil line which is cooled down to 80℃ after heat exchange and flows out as product. Before heat exchange, lead a branch to the inlet of the oil pump, which can be used in the equipment wire in case of furnace tube coking when the production reduces or the flow of bottom oil fluctuates. The vacuum residue is extracted from the bottom of the vacuum tower by the pump after it is cooled to 120 ℃, one of which flows out, one of which mixes with the second and third vacuum side stream into the mixed heavy oil line and flows out. Crude heat exchanger before desalination: crude oil of about 20-45 ℃ flows into the heat exchanger and then into the electrical desalter after being heated up to 110-120 ℃. Crude heat exchanger after desalination: desalted crude oil flows into the primary tower after being heated up to 220-240℃. Primary distilled oil heat exchanger: After primary distillation the oil flows into the heat exchanger and is heated to 270-280 ℃. Primary overhead oil heat exchanger: the overhead oil gas is cooled down to 40℃ after passing through the overhead hot-water heat exchanger and air cooler and flows into the overhead reflux tank. Overhead oil gas heat exchanger: the oil gas from the atmospheric overhead enters into the return tank (Volumn-103) for oil-water separation after being cooled to 70 ℃ by the air cooler. Overhead oil-water cooler: Non-condensable oil gas is cooled down to 40 ℃ by the condenser after entering the overhead product tank for oil-water separation. First-line oil heat exchanger: the primary distilled oil which is heated up to 370-380 ℃ by the atmosphere furnace flows into the first-line oil heat exchanger and is cooled down to 45℃. Second-line oil heat exchanger: the primary distilled oil which is heated up to 370-380 ℃ by the atmosphere furnace flows into the second-line oil heat exchanger and is cooled down to 60-70℃. Third-line oil heat exchanger: the primary distilled oil which is heated up to 370-380 ℃ by the atmosphere furnace flows into the third-line oil heat exchanger and is cooled down to 70℃. First vacuum side stream heat exchanger: first vacuum side stream is exhausted from the first layer of oil sump tank and cooled down to 80℃ after heat exchange, some of which flows out as product and some of which returns to the upper part of the first padding section as vacuum overhead reflux oil after being cooled down to 40℃ by the condenser. Second vacuum side stream heat exchanger: second vacuum side stream is exhausted from the second layer of oil sump tank, one line of which is cooled down to 80℃ after heat exchange and flows out as product, one of which returns to the upper part of the second padding section as vacuum overhead reflux oil and the other of which returns to the upper part of the third padding section as light wash oil with no need to be cooled. The vacuum residual oil heat exchanger: the vacuum residual oil is extracted from the bottom of the vacuum tower by the pump after it is cooled to 120 ℃, one of which flows out, one of which mixes with the second and third vacuum side stream into the mixed heavy oil line and flows out. Due to the high viscosity of crude oil, generally use plates with deep corrugation. Due to the unstable temperature of the chemical system temperature of the system, adopt the fully-welded type for the heat exchanger with the temperature of over 100℃, otherwise the detachable plate heat exchanger with the EPDM gasket. The main function of the atmospheric tower is to cut the fractions below 350 ℃, such as gas, coal, diesel, etc. The specification of the atmospheric tower is f6000x45335mm and the inner parts of the tower plan to apply a composite hole miniature fixed valve tray. 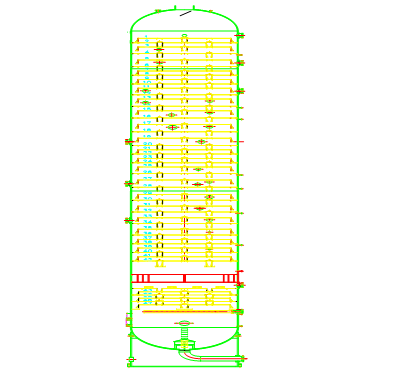 There are 48 layers of trays in the whole tower, 5 layers of which are the stripping section.